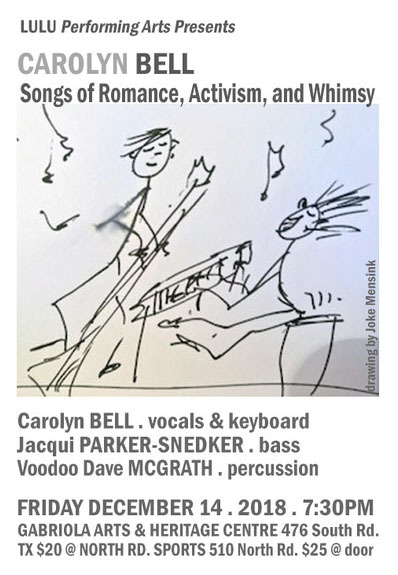 Carolyn (vocals, keyboard), known as a visual artist on Gabriola, was working on a cd of original tunes in Vancouver the mid ‘80s when her mother died and she left music pretty much on the back burner. Since she came to Gabriola, the music has come back (not surprisingly! ), and Carolyn has appeared at local jams and open mics, The Ecumenical Society, and Lulu’s “The Rogue Turkey Show” in October of 2016. Carolyn has been re-inspired to unearth some of her original material. Jacqui Parker-Snedker (bass), has studied with both jazz greats Wyatt Ruther and Earl Mays (Dizzy Gillespie’s bass player), and toured with numerous bands throughout Canada and the US, including “She”, then with “Mama Quilla 1 & 2”. Arriving in Vancouver Jacqui and Heidi Archibald co-founded the band, “Key Change”, then she joined the band “Jessee Jane”. Jacqui is also the founder of BROADBAND here on Gabriola. December 14th’s concert will feature a lot of originals and will include a mix of jazz standards, songs by Canadian singer-songwriters such as Melissa McLelland (half of the group ‘Whitehorse” – the other half being Luke Doucette), Jenny Ritter, a young and amazing singer-songwriter from Vancouver Island, Buffy Saint Marie, plus an obscure protest/warning song from American Dave Frishberg (who wrote the brilliant “I’m Hip” sung by the great Blossom Dearie). These are a few examples of the repertoire. 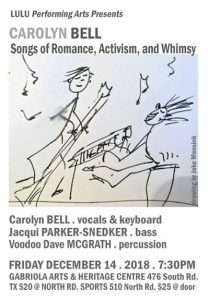 Carolyn and Jacqui will be joined by the wonderful Voodoo Dave McGrath on percussion. An intimate night of fun and music awaits.